April is here and the month is absolutely PACKED with events! The month begins with Boulder Arts Week and the opening day of the Boulder Farmer’s Market, followed by the Tulip Fairy and Elf Festival, the Conference on World Affairs and the Taste of Pearl just to name a few. Have a wonderful April! When: Fridays, March 22 – April 26, 2019, full schedule here. Head over to Lyons every Friday night in April for The Wildflower Concert Series at Planet Bluegrass. A new artist every week, enjoy live music in Planet Bluegrass’ indoor Wildflower Pavilion. Full schedule here. Planet Bluegrass is located at 500 W Main St, Lyons, CO 80540. Tickets $15 – $25, available here. Longmont Restaurant Week is a 10 day event this March 29 – April 7, during which local restaurants and more offer special menus at the two different price tiers: $18.71 and $28.71. What can you expect from Longmont Restaurant Week? Delicious deals at more than 40 participating venues! Whether you elect for the $18.71 menu or the $28.71 menu, you are guaranteed a discount on the best of what that restaurant, cidery, distillery, or brewery can bring to your table. For more info, click here. This event will be held at the Glenn Miller Ballroom at CU Boulder, 1669 Euclid Avenue, Boulder CO 80310. Tickets $10, available here. Free and open to the public, Lafayette’s 15th annual Cesar Chavez Celebration will kick-off at 12:00PM at Alicia Sanchez International School (655 Sir Galahad Drive), where a Convivio featuring free refreshments, live entertainment, children’s activities, and student presentations, will be held. This event is brought to you by the Lafayette Youth Advisory Committee with support from Lafayette Communities that Care. This event will be held at Sanchez Elementary School, 655 Sir Galahad Dr, Lafayette, Colorado 80026. This event is FREE. The CollaBEERation 5k & Brew Fest is all about friends, food, beer, music and giveaways! Shoes & Brews presents this 5k run/walk followed by a unbeatable after-race expo. For all the details, click here. Dogs and strollers allowed. Non-alcoholic options available. Shoes & Brews is located at 63 S Pratt Pkwy Unit B, Longmont, CO 80501. Tickets $35 – $40, register here. The Lyons International Film Festival honors the trailblazers, and the resilience and perseverance of strong individuals who love life. Film makers from all over the world want to share their films and documentaries with Lyons. Enjoy films and inspiring visions shown through the lens and camera’s of many who enjoy the outdoors and nature and walking the road less traveled. For the full schedule and more info, click here. The festival will be held at Rogers Hall, 400 High Street, Lyons, CO. Tickets $10 – $25, available here. Astronomy Day is a FREE day full of family-friendly activities, telescope observing, and planetarium shows focused on our Moon. Join Fiske Planetarium and Sommers-Bausch Observatory for activities including special talks, scale solar system tours, stomp rockets, comet labs, telescope observing session, and light labs. Come for an hour or stay all day. The CU Science Discovery, Boulder Astronomy & Space Society, and International Dark-Sky Association and will also join us to provide more activities and information. For all the details, click here. Fiske Planetarium is located at 2414 Regent Dr, Boulder, CO 80309. This event is FREE. Join Oskar Blues for the Lyons Old-Time Square Dance: old-time reels, mixers, squares, waltzes and flatfooting to live fiddle/banjo music featuring old-time string band Nine Dollar Shawl! All dances are taught and are beginner/family-friendly. Dances are easiest earlier in the evening and become more complex as the evening progresses. Come alone, bring family/friends/kids and join our mix of beginner and welcoming seasoned dancers. No experience, partner or special shoes required. 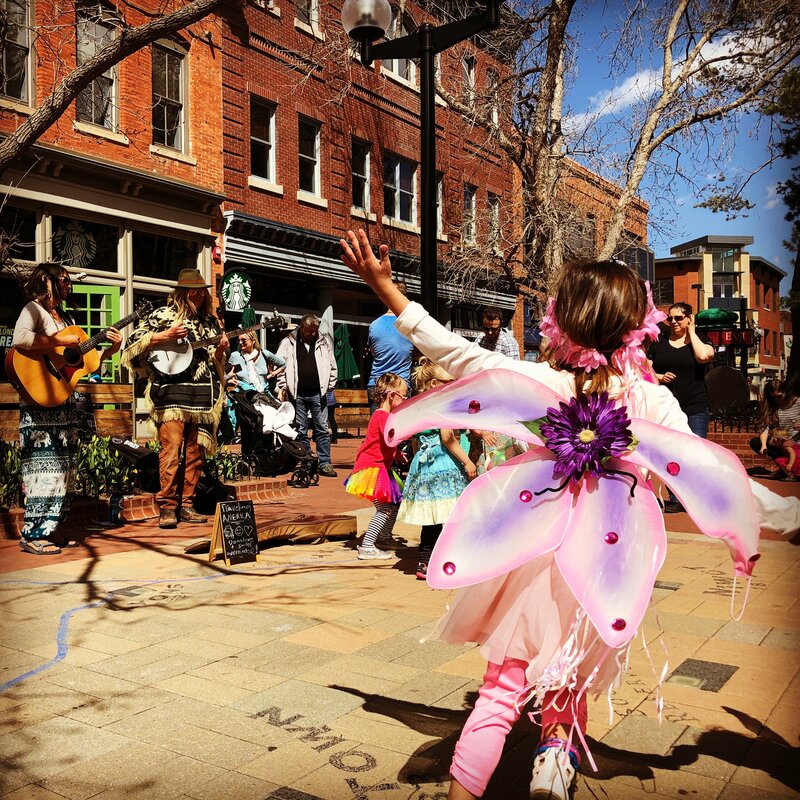 Spring officially arrives in Downtown Boulder with the Tulip Fairy and Elf Festival. Festival goers can witness the vibrant Tulip Fairy, along with pint-sized fairies (including the fabulous Flora the Fairy) and elves, parade around the Pearl Street Mall ‘welcoming the tulips’. This beloved springtime tradition in Boulder features special events and activities for girls and boys and celebrate the more than 15,000 tulips that adorn the world renowned Pearl Street Mall throughout the spring season. The event includes live stage performances including Boulder Performing Arts, The Rock and Roll Playhouse, Emelise & local favorites Jeff and Paige! Kids will also love the face painting, foam sword dueling, art projects and tons of other fun activities. The festival will be held in downtown Boulder on the Pearl Street Mall, 1942 Broadway, Boulder, CO 80302. This event is FREE. Milk and Honey Farm and Hazon present a day of eating, hands-on activities, workshops, music, art, and farm tours at the Colorado Jewish Food Fest. This multi-sensory day is a way to connect with your roots and experience how Jews do food in the 21st century. The festival will be held at the Boulder JCC, 6007 Oreg Ave, Boulder, CO 80303. Tickets $5 in advance, $10 at the door. Register here. When: April 9 – April 13, 2019, full schedule here. The Conference on World Affairs Week held at the University of Colorado Boulder, offers events without admission fees to the Boulder community, students, and the public. CWA Week is a festival of ideas featuring 200 panels, 100 speakers and performers, over 5 days, attracting more than 70,000 in cumulative attendance each year. The Conference also present the CWA Speaker Series where thought leaders in their field join together for a campus visit with an evening discussion open to all. CWA Week is held at CU Boulder. This event is FREE and open to the public. This event is held at the Boulder Reservoir, 5565 Reservoir Rd, Boulder, Colorado 80301. Cost: $25/runner in advance ($35 race day), $7/dinner ticket for non-runners. Discounts available with 4 and 6 pack purchases. Tickets available here. Get rid of plastic in your lunch box, and make a couple of reusable beeswax infused food pouches with the BeeChicas. Learn about plastic in our oceans, rivers, and bodies, and how you can help improve our health and ecosystem. Registration required, ages 8 to adult. Adult supervision required for children under 12. This program is part of several Seed to Table events and services at the library that focus on sustainable living. This event will be held in the Mt. Sanitas room at the Boulder Public Library (Main Library). This event is free, but please register here. Looking for something fun and FREE to do with your children on BVSD’s Spring In-service Day? Hop into Spring with Thorne Nature Experience at the Sombrero Marsh Environmental Education Center. Kids will enjoy nature crafts, a fire-making demo, face-painting, nature hike explorations with Thorne Staff, and dancing and singing in rainbow socks with the best nature performers – Jeff & Paige at 11AM! Pack a picnic lunch and a picnic blanket to enjoy the mountain views. Thorne will have light refreshments donated by in-kind sponsors. This event will mostly be outdoors, rain or shine. Please plan for the weather and bring sunscreen, layers, and water. Carpooling with friends is recommended. For more info, click here. This event will be held at Thorne Nature Experience, 1466 63rd St, Boulder, Colorado 80303. This event is FREE, but tickets are limited. Register here. When: April 13 & 14, 2019 full schedule here. Learn about your Scottish-Irish ancestors at the Colorado Tartan Day Festival. It’s a chance to wear those kilts, bodices, Outlander gear and all the tartans. Live music and dancing, as well as a variety of Celtic house goods, jewelry, leather goods, food trucks, re-enactment performances and much more. Well behaved pets welcome! More details here. The festival will be held at Boulder County Fairgrounds, 9595 Nelson Road, Longmont, Colorado. This event is FREE. Celebrate the end of the ski season with Eldora Mountain Resort‘s Pond Skim. Grab your best beach outfit and test your skimming ability to rock out the last day of the season. The Pond Skim is open to all ages. Eldora Mountain Resort, 2861 Eldora Ski Rd, # 140, Nederland, Colorado 80466. Event is free. For lift ticket prices, click here. The CU International Festival has been around since 1990, and has continued to successfully promote diversity among students and the Boulder community. Every year, the CU International Festival Committee provides a stage for great performers who show cultural dances, play traditional instruments, or sing in their native language. The festival has gotten bigger every year, with over 30 countries participating and over 6,000 people attending. For more info, click here. The festival will be held at the Glenn Miller Ballroom at the UMC, 1669 Euclid Ave, Boulder, CO 80309. The event is FREE and open to the public. Join the Boulder Opera Company for a lively evening of cocktails and operatic singing! Boulder Opera will be touring Pearl St., making stops at the following hot spots: The Attic Bar & Bistro, Centro Mexican Kitchen, License No. 1, and West End Tavern. This event will take place at multiple locations on Pearl Street — all the details here. This event is free to the public with a suggested donation of $10-$30. Donations can be made here. Tarana Burke shares the story behind the genesis of the viral 2017 TIME Person Of The Year-winning ‘me too.’ Movement, and gives strength and healing to those who have experienced sexual trauma or harassment. #MeToo is not just an overnight hashtag sensation; Tarana has dedicated more than 25 years of her life to social justice and to laying the groundwork for a movement that was initially created to help young women of color who survived sexual abuse and assault. A sexual assault survivor herself, Tarana is now working under the banner of the ‘me too’ Movement to assist other survivors and those who work to end sexual violence. She is also senior director of programs at Brooklyn-based Girls for Gender Equity. On stage, she provides words of empowerment that lift up marginalized voices, enables survivors across all races, genders, or classes to know that they are not alone, and creates a place for comfort and healing to those who have experienced trauma. For more about Tarana, click here. This event will be held at the Macky Auditorium, 1595 Pleasant St, Boulder, CO 80309. Tickets $25, available here. Joan Osborne has rightfully earned a reputation as one of the great voices of her generation — both a commanding, passionate performer and a frank, emotionally evocative songwriter. She will be performing songs of Bob Dylan at the Caribou Room in Nederland. The Caribou Room is located at 55 Indian Peaks Drive, Nederland, CO 80466. Tickets $36 – $42, available here. Neptune Mountaineering presents a night of strong, passionate women playing on the big screen! A No Man’s Land Film Festival film screening will be accompanied by a pre-show mingle and gear + goodies raffle at intermission. Everyone is invited (kids, spouse, best friends, co-workers, etc.!) to attend this Boulder, CO showing of women in adventure! Proceeds will support 501c3 nonprofit, Outdoor Women’s Alliance. The festival will be held at Neptune Mountaineering, 633 S Broadway, Boulder, CO 80305. Tickets $15 – $29, available here. Go with the (ice) floe, tighten your chinstraps and waddle in for some epic family fun! The CU Museum is accentuating Antarctica, the coldest, windiest place on earth for Family Day: Modern and Historic Explorations of Antarctica. Antarctica isn’t all penguins- Meet the CU scientists who venture into some of the harshest climates and learn about what it is like to live there; step into an actual tent from Robert Falcon Scott’s ill-fated journey, try on modern expeditionary clothing; make your own ice core and SO much more! This event will be held at the CU Museum of Natural History. This event is FREE & open to the public. The 5th Annual Longmont Earth Day Celebration promises to be the best yet. With family-friendly programming all day long, this event will have music, butterflies, recycled arts and crafts, and even live birds of prey! Jeff & Paige will bring science and nature to life through kid-delighting music and stories. We’ll have an Environmental Education Expo all day in the Atrium represented by more than twenty local groups. For more information and full schedule, click here. This event will be held at the Longmont Museum and Cultural Center, 400 Quail Rd, Longmont, CO 80501. This event is FREE. The Ethiopian Festival is a FREE, family-friendly event for all ages to enjoy a traditional coffee ceremony, African music/drumming & basket weaving for various ages and abilities. Big gratitude to the Lafayette Cultural Arts Commission for their generosity in making this possible! This festival will be held at Ras Kassa’s Ethiopian Restaurant, 802 S Public Rd, Lafayette, CO 80026. This event is FREE. Comedy Works and Stanley Live are pleased to present Craig Robinson & The Nasty Delicious at The Stanley Hotel. The Stanley Hotel is located at 333 E Wonderview Ave, Estes Park, CO 80517. Tickets $49.50 – $99.50, available here. Erie’s 22nd Annual Arbor Day & Earth Day Celebration features free tree seedlings, free educational information, drawings for prizes, certified arborist Q & A booth, hands-on tree plantings and kids’ craft area. This event will be held at Erie Community Park, 450 Powers St, Erie, CO 80516. This event is FREE and open to the public. SuperKids, one of Colorado’s largest kid eventsis coming back to The Orchard Town Center. A super fun day for the family with loads of activities and best of all it’s FREE. Dress in Costume! Post your pictures to be entered in our drawing of prizes. Battle of SuperHeros, Pony Rides, Bouncy Castle, Rock Climbing Wall, Skateboarding Demos, Kids Performances, Camp Giveaways, and loads more. This event will be held at the Orchard Town Center, 14697 Delaware St, Broomfield, CO 80023. This event is FREE. The Boulder Phil performs The Dream of America. The hope of new beginnings and wide-open possibilities animates Peter Boyer’s Grammy-nominated Ellis Island, recently featured on PBS’ Great Performances series. Emerging from the Ellis Island Oral History Project, monologues by seven actors are interwoven with a full orchestral score and projected images from Ellis Island archives. From Dvořák’s vision of a new landscape, weaving Native American and African American sounds into a symphony, to Boyer’s moving stories of those who left everything to come here, we conclude our season of Open Space with music that reflects the hope, courage, and grace of those who built the dream of America. Arrive early at 6:30 PM for a pre-concert talk with host Marilyn Cooley, Michael Butterman and guests. This event will be held at the Macky Auditorium, 1595 Pleasant St, Boulder, CO 80309. Tickets $15 – $82, available here. Centennial State Ballet presents the Shakespearean Classic, A Midsummer Night’s Dream. Celebrate the culmination of Centennial State Ballet’s 21st performance season, Coming of Age, with magical dragonflies and fireflies, a mischievous Oberon, and impish Puck, a slumbering donkey, and lovers from both the mortal and fairy realm. A masterful combination of storytelling and choreography performed with the exquisite sounds of Mendelssohn will transport you into the woodland realm of fairy fantasy. Featuring the Centennial State Ballet Chamber Orchestra and Longmont’s pre-professional youth ballet company! This performance will be held at Niwot High School, 8989 Niwot Rd, Niwot, CO 80503. Tickets $25, available here. Head to Downtown Boulder for an unforgettable afternoon exploring Boulder’s tantalizing culinary arts scene at Taste of Pearl. Celebrating Colorado’s distinctive wines and spirits and, amazing food while strolling through some of Downtown Boulder’s most vibrant galleries and retails stores. Tickets have sold out every year so get yours fast! This event will be held at the Pearl Street Pedestrian Mall, Boulder, Colorado 80302. Tickets $65 – $75, available here. Many of Oliver’s poems are a joyful celebration of nature, but she also wrote about the abuse she suffered as a child and her first brush with death from lung cancer. Ruth Franklin says her work is infused with a deep spirituality. “The way she writes these poems that feel like prayers, she channels the voice of somebody who it seems might possibly have access to God. I think her work does give a sense of someone who is in tune with the deepest mysteries of the universe.” At this memorial reading, come to Innisfree to read a poem of Mary Oliver’s that stays with you and stays with you and stays with you. Innisfree Poetry Bookstore & Cafe is located at 1301 Pennsylvania Ave, Boulder, CO 80302. This event is free.